Defending God and country in time of war is risky business. One either has to face and fight the enemy, living through the conflict, or show the enemy another side and head for the hills. Psychologists refer to this choice as “fight or flight.” Needless to say, I wouldn’t be writing this today, and you wouldn’t be reading it, if throughout history our ancestors hadn’t survived one or both of those actions. I believe the old saying goes, “Discretion is the better part of valor.” The Original Family Narrative (OFN) says that our ancestors were “Old Brittons,” and we’ve cited several sources in earlier articles who claim that they were driven into the mountains of Wales [see “Faith of Our Fathers: Part I”]. It isn’t clear if these Brittons ran forward up the slopes, having thrown their swords down, or backed up, fighting as they retreated. The main thing is that they lived to fight another day. Knowing where to begin with a story like this is also risky business, because, for example, if we say we are related to the Percys, friends of William the Conqueror [see “Upon This Rock: Part I” and “Pearce Lines: Part I”], then war has always been a part of our nature. William de Perci (c.1033-1096) was awarded an estate in North Umberland by William the Conqueror for being a loyal friend and confidant after the invasion of Britain in 1066. One source says that de Perci was actually King William’s fleet commander. Or if, on the other hand, we wish to associate with our early Beards, who were mostly Quakers [see “Our Quaker Beginnings”], we must remember that not only wouldn’t they fight, they wouldn’t even pay the tithes to the State Church that enabled others to fight on their behalf. The Austens seemed to have found themselves in the middle. From the time of St. Augustine and the Roman invasion, they were well represented on the side of the dominant political and military powers: Roman Catholic priests, English Baptist elders (though considered non-conformists), and soldiers and sailors in the King’s Army and Royal Navy, according to the OFN. And, if later religious practices are any indication, our Pearces were also non-conformists, probably Methodists, but we have no record of direct military service, except that various coats of arms exist from earlier family branches and several famous Pearces who proudly supported the King. So, we leave those uncertain times and places for another day and move ahead to well-documented experiences in another land. EDWARD PEARCE (1701-1777) was born in Ireland on the family’s Enniskillen farm in Farmandagh County and emigrated to America in 1737. (See “Pearce Lines: Part I.) Two of his children died of small pox on the voyage and they, along with Edward and wife Frances, are buried in Radnor near the family’s Great Valley farm 20 miles northwest of Philadelphia. He was the son of Cromwell Pearce, one of five Pearce brothers who had come with Oliver Cromwell to the emerald isle in 1649 and fought in the famous Battle of Boyne in 1690. After the victory, they were awarded land, but several of the brothers returned to England. Edward’s son, also named Cromwell, remained in Pennsylvania after the rest of the family moved to Kentucky. He and wife Margaret raised a large family. Cromwell fought in the American Revolutionary War and was eventually commissioned Colonel in 1777, the same year his father died, and was given command of the 5th Battalion of the Chester County Militia (from the “Pearce Family” newsletter which is based on a booklet by Clifford F. Pearce). ISAAC PEAIRS (1730-1810) has had his surname spelled every way you can imagine and probably came to Fayette County, Pennsylvania, from Maryland or Virginia [see “Pearce Lines: Part II”). For example, George Dallas Albert’s 1916 report to the Historical Commission in Harrisburg entitled “Frontier Forts of Pennsylvania” spells it “Pearse.” That Isaac built a small blockhouse around 1774 to protect his family and friends against possible Indian attacks. The last known remnants of the fort were among some Lombardy poplars in 1858 about four miles north of Uniontown on old US Rt. 119. This was on the western slope of the Chestnut Ridge, not far from George Washington’s Fort Necessity and the scene of Braddock’s defeat. Pearse’s Fort sat beside the Catawba Trail, better known as the Cherokee Trail that stretched from Florida; through Georgia, the Carolinas, and Virginia; and into Western New York and Canada. Little more is known about the fort, but for a detailed description of the Indian thoroughfare it surveyed see James Veech’s The Monongahela of Old. It’s also mentioned in William Garbarino, Jr’s Along the Monongahela (2000). Isaac is proudly listed in the Membership Directory of the Sons of the American Revolution (1993), along with several other Pearces, none of whom are directly related to us as far as we know. GEORGE PIERCE ( ), possibly a son of the above Isaac, joined an expedition that marched on what is now Sandusky, Ohio, but was in 1782 an “Indian Town.” Volunteers were gathered from Fayette, Westmoreland, and Washington Counties in Southwestern Pennsylvania. JOHN PIERCE ( ) was probably another member of the above family and fought in the War of 1812. He may be the same as Captain John Pierce who served in the artillery at the Federal Beaver Block House, Beaver County, PA, in 1793. We don’t believe that he is the same John as is mentioned below, however. JOHN PIERCE (1750-1846) is listed in every Butler County, Pennsylvania, historical reference book, including R.C. Brown’s History of Butler County (1895) and C. Hale Sipe’s 1927 two-volume set by the same name. John served the New Jersey Line from Monmouth County during the Revolutionary War before moving to Western Pennsylvania. One source says that Indians drove him out of a cabin he had built in Turtle Creek, near what is now McKeesport on the same Monongahela River that other Pearces had settled by. Moving north, he built another cabin in Butler County in 1796 and married twice, producing children even into his senior years. He had a son named John also, who produced nine children. Again, while we’ve been in contact with remnants of their offspring from around the country, we know of no direct link to our Wesley, John, Alfred, and other Pearces of Southern Butler County, although they are sometimes confused. BENJAMIN PEARCE (1757-1847) lived in Fayette County, PA, and also served as a Private in the New Jersey Line during the American Revolution for about six months and was no doubt related to one or all of the above. His brother Jonathan (1762- ) lived in New York and also with their father in Sussex County, New Jersey. ISAAC PEARCE (1840-1912) was the brother of Austen Pearce, for whom the grand historical Pearce House in Harmony, Pennsylvania, is named [see “The Pearce Blanket: Keeping the World Warm.”]. They were sons of Alfred the banker and entrepreneur, the oldest son of our Richard and Susan Austen Pearce. Not long after marrying Ada Holmes in 1860, Isaac signed up for service with the 139th Pennsylvania Volunteers, Company E, men who saw action in at least 50 battles including Chancellorsville, Spotsylvania, the Wilderness, Petersburg, and Gettysburg during the American Civil War. 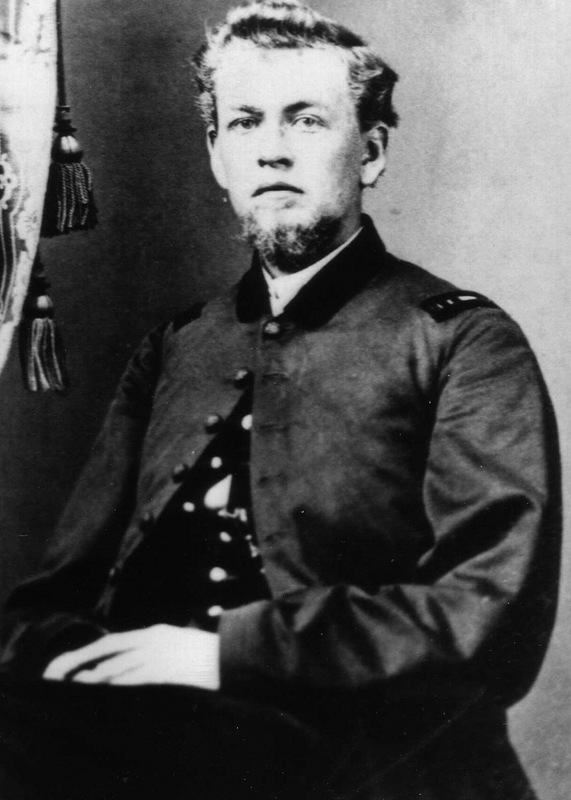 It is believed that Isaac reached the rank of 1st Lieutenant just prior to being mustered out, but it certainly went with the honor of being elected to the office of Chaplain by the men he served with after he was wounded on May 3, 1863, at the Battle of Salem Church, Virginia. This was exactly two months before the deadly battle of Gettysburg. His records show his promotion to Chaplain on June 30, the day before the bloody action commenced around that small Pennsylvania farming community less than 200 miles from his home. Isaac survived the slaughter and was honorably discharged on June 21, 1865. He eventually became an ordained minister. Isaac and wife Ada had four children together, Anne, Sarah, Edward, and Frank, and over the years lived in six states, but he served his longest call in Knoxville, Tennessee. He died in the Church Home and Infirmary in Baltimore at age 72, and his body is buried in Knoxville, TN, perhaps in the cemetery of one of his charges. According to cousin Terry Jones, who’s been researching Isaac for many years, his name is listed on the Pennsylvania memorial in Gettysburg mistakenly with the middle initial “C.” Federal service records list it as “A,” probably after his father, Alfred, or great-grandfather, Ambrose. DALE NELSON PEARCE (1918-1981), my uncle and the great-grandson of Richard and Susan Austen Pearce, was one of the last descendants born at the Pine Creek settlement in Allegheny County north of Pittsburgh [see “The Sons of Wesley & Bessie”]. He was also the first in that family to attend college. Shortly after graduating from Slippery Rock State Teachers College, now a University, in 1940, he was drafted into the U.S. Army and shipped overseas. Dale served in the 82nd Airborne Division of the 376th Bombardier Group. In 26 months he spent time in India, Egypt, Tunisia, and Italy. While on a 30-day leave in 1945, he married his college sweetheart, Helen Andre (read her early informal biography at “My Childhood, My Family, My School Days.”) Dale had to return to duty for several more months afterwards. Upon his discharge, he accepted a teaching position at Grove City, PA, and there the couple raised four boys: Ronald, Lee, James, and Thomas. Dale served the district for 29 years and retired from there as Superintendent before being called back to service by the Mohawk Valley district for a similar position. Both Dale and Helen are the latest of four generations buried in the Pearce Family section of the Crossroads Presbyterian Church Cemetery near where the original Pearces and Austens first settled. They each lived happy and productive lives in service to God and country as well as their family and community. While there must be hundreds of other namesakes who have been associated with serving their country, our article ends here with just a mention of several additional Pearces who have been part of the U.S. Military, my brothers Paul Wesley and Carl Dale. Both were born in Butler County, PA, and spent most of their childhood there. Paul (1940 – ) graduated from Penn State, was commissioned a 2nd Lieutenant in the Air Force, and married Cynthia Cordero all on the same June day in 1962 before shipping off to the West Coast for further training. Stationed on Guam during the Viet Nam War, he piloted the B-52. After attaining the rank of Captain, he was honorably discharged and flew to cities around the world as a civilian for various airlines, including Pan Am and Delta. He and Cindy raised two sons, Steven and Stuart, while residing at various times in Florida, Connecticut, and Virginia. Son Steven served in the U.S. Marines and was deployed to Iraq with the Army National Guard. Now retired, Paul drives Cindy around the North American continent in an Airstream RV and they do a variety of volunteer work in their Charlottesville area community. They have five grandchildren. Brother Carl (1942-2004) drove a commercial big rig for 35 years. Like his brother Paul, he’s always had the “bug” to travel and, ironically, the desire to keep aircraft flying, but his military branch of choice was the U.S. Navy during the 1960s. His port of call was the Patuxent Naval Air Station in Lexington Park, Maryland, where he serviced fighter planes. He married Jean Hathazy, and they raised two children, Kenneth and Diana who produced five grandchildren. Ken served in the U.S. Army and married Niki Kotchman, an Army nurse-midwife. Their daughter Taylor and son Logan both graduated from the U.S. Military Academy and are on active duty. Ken and Niki’s son Nolan now attends West Point and his twin brother Garrett is in ROTC at college. Together, Paul and Carl Pearce have ten grandchildren [see “The Sons of Wesley & Bessie: Part III Ralph”]. That’s very productive work, no matter how you look at it. Gallagher, Gary W. The Wilderness Campaign. Chapel Hill: U. N.C. Press, 1997. Opat, Donna, ed. “Pearce Family Newsletter.” Lindsborg, KS, summer1997. Pearce, Clifford F. [booklet on Pearces from 1701-1981 quoted by Donna Opat, Ed. Pearce Family Association, Lindsborg, KS, 1997]. Rhea, Gordon C. The Battles for Spotsylvania Courthouse and the Road to Yellow Tavern May 7 – 12, 1864. Baton Rouge: Louisiana State U. Press, 1997. Good to hear from you. I got involved with Isaac some years ago when a distant cousin from Butler Co., PA, Terry Jones, gave me some details of Isaac’s life. I’ll have to recheck that file before getting back to you. I’m sure he’ll want to know about you, if I can find his number. The Knoxville burial was surely church-related. After leaving the GAR and becoming ordained, he served a large church there for many years. We don’t know why he chose his “flock” over his family in Western PA, unless his wife and kids had settled in Tennessee. How can I get copies of the pictures that might contain Lt. Pearce? Have you read the article on the “Pearce Blanket,” which contains details about his family? We have in our possesion Isaac A. Pearce’s diary written in his hand for the year 1864. Is there anything I should be doing with it?